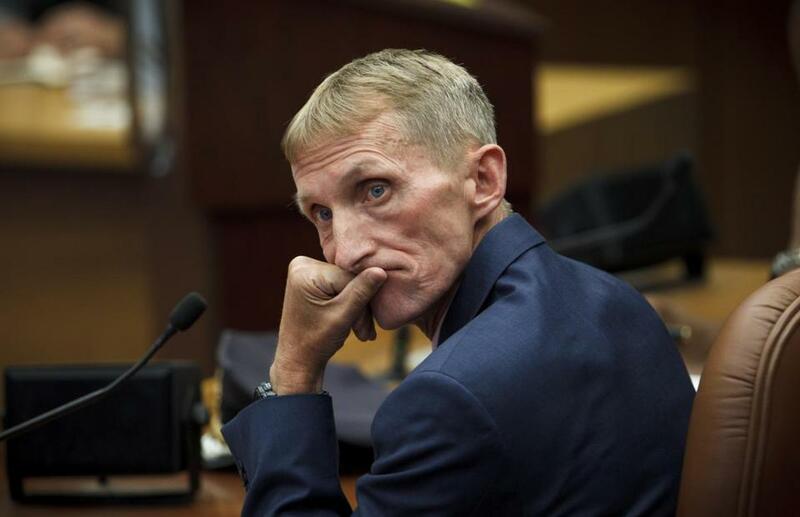 Boston Police Commissioner William Evans. Richard Coyne couldn’t sleep. At first, it hadn’t seemed real: His mother, Barbara, couldn’t have been slashed to death by an intruder in their South Boston home in April 2012. He couldn’t have found her as she lay bleeding. She couldn’t be gone. But after a few days, it hit him, and he spent nights snapped wide awake. Meanwhile, Boston police detectives fanned out across the city, searching for the killer. The homicide unit was four months into a major overhaul: it had just added investigators, expanding by more than a third. Detectives had more support from civilian staff, including a crime analyst. They were receiving more training, and more technology. Within a week the homicide unit — which had a history of solving less than half the city’s killings — had charged a heroin addict with Barbara Coyne’s murder. After years of lagging behind the rest of the country in solving homicides, the department’s upgrade has yielded a 10 percent jump in the rate at which detectives solved murders over a two-year period, according to a Northeastern University study released recently and publicized last week by the researcher and Boston police. The stepped-up effort, which began in 2012 with a grant from the US Bureau of Justice Assistance Smart Policing Initiative, brought in researchers from Northeastern University. It was led by Anthony Braga, director of the School of Criminology and Criminal Justice and a Police Department consultant, and studied the impact of the changes. That effort has a real-life consequence for crime victims’ loved ones — Richard Coyne among them. Between 2007 and 2011, Boston police homicide detectives cleared 148 of 314 killings, or just 47 percent. After the intervention, between 2012 and 2014 they solved 86 of 151 killings — or 57 percent. And these numbers do not take into account the cases that were still before a grand jury awaiting indictment when researchers pulled the statistics. 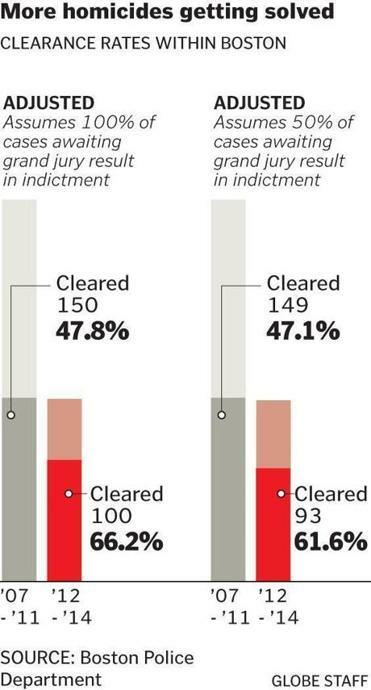 When researchers assumed that half of the cases before the grand jury would be indicted — a conservative estimate, given that most homicide cases brought to grand jury result in indictments — the adjusted clearance rate for 2007 stayed at 47 percent, but the rate for 2012 to 2014 jumped to 62 percent. Boston’s improvement came as the national clearance rate held steady, and the rest of Massachusetts saw rates drop, Braga said, so Boston’s improvement was not simply the product of a larger trend. The overhaul began with research: Police Department staff worked with investigators to comb through every single homicide file from 2007 to 2011 and interview detectives. They analyzed case characteristics and investigative practices, including actions of first responders and number of detectives, to see which elements led to arrest and conviction. They also studied best practices in other countries. Then, the department started making changes. The homicide unit, commanded by a lieutenant detective and composed of one cold case squad and eight current case squads, was expanded. An extra detective was added to each of the squads, which already had two detectives and a detective sergeant. A civilian crime analyst was brought in, and an extra victim-witness resources officer was added. Homicide staff received extensive training in investigative techniques. A standardized set of protocols designed to guide investigators from first response to arrest was implemented. The homicide unit began convening monthly to review all open investigations. Investigators regularly reviewed the processing and testing of physical evidence. The homicide unit also got new tools, including 3-D shooting incident reconstruction technology to help identify bullet trajectory. In the period between 2012 and 2014 compared with 2007 to 2011, more detectives worked each case. They interviewed more witnesses and collected more evidence. In the period before the intervention, 60 percent of cases saw at least one search warrant executed. But afterward, that number climbed to 71 percent. Before the intervention, only 29 percent of cases included DNA testing. Afterward, 43 percent included DNA. Strong evidence and investigations increase the likelihood that a case will end with a conviction. Conviction rates in homicide cases have remained between 80 percent and 90 percent each year, reaching 85 percent in 2016 up by 1 percent from last year, said Conley. At around the same time the Police Department received a boost in resources, the district attorney’s office purchased two new laboratories to analyze video evidence and cellphone data. The proliferation of high-quality video footage, cellphone evidence, and advancements in analyzing forensics coupled with increased resources for investigating homicides have certainly helped, Conley said. Richard Coyne still talks with the detectives who solved his mother’s murder and the Suffolk assistant district attorney who put her killer away for life. They text at holidays and on Mother’s Day. Evan Allen can be reached at evan.allen@globe.com. Follow her on Twitter @EvanMAllen. Jan Ransom can be reached atjan.ransom@globe.com. Follow her on Twitter @Jan_Ransom.